Oak is the common name for several hundred species of the genus Quercus with a wide variety of trees. They are native to the northern hemisphere and include both deciduous and evergreen species. Evergreen species are commonly called "live oak" and are not a distinct botanical group. Culturally, the oak is a symbol of strength and endurance. It is the national tree of Germany, the United Kingdom, and the United States. Oaks were considered sacred by the Celts, and the name of their priests, druid, comes from the words for oak and for knowledge. Oak trees grow slowly to a mature height of one hundred feet with a spread of fifty to eighty feet. They are deciduous broadleaf trees. Most oak leaves, though not all, have lobed margins that turn yellow or brown in the autumn. The edible fruit is a nut, called an acorn in English. The oak typically lives from 200 to 600 years. Oaks are used as food plants by the larvae of many Lepidoptera species. Oaks prefer deep, rich, slightly acidic loam with plenty of organic matter. They are, however, quite tolerant of other soils. Their leaves are slightly acidic and, if allowed to compost where they fall, will gradually change the soil to the tree's preferred pH level. These trees grow best in full sun to light shade. Many oaks are tolerant of urban pollution and soil salt, so they are often grown as street trees. They are hardy to zone 4. 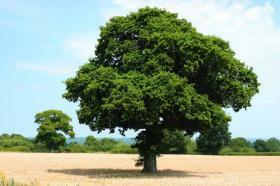 Most oak species prefer evenly moist soil, but are tolerant of wet and dry conditions once they are established. Oaks need little maintenance. Dead or damaged wood can be removed at any time. Other pruning should be done in late winter or early spring. Trees should be transplanted while still small. Oaks should be transplanted in the spring for best results. Water the transplanted saplings regularly for the first two seasons, until the root system is established. Oaks seed themselves readily if acorns are left on the ground. Most oaks are not troubled by pests or diseases. The most common diseases are a water mold, sudden oak death (Phytophthora ramorum), and a fungus, oak wilt. Older trees may suffer from root rot. Most oaks are large trees! They are usually planted as specimen and/or shade trees. The leaves of many species turn a brilliant gold in autumn. Oaks are hardwood trees, and are valuably commercially for furniture and flooring, especially the various red oak and white oak species. The bark of the cork oak is used to produce stopper for wine and olive bottles. Several species are valued for making barrels to age wine and spirits; the oak wood contributes to the taste of the final product. Traditionally, white oak bark was dried and used in medical preparations. Oak bark is rich in tannin, and is still used in tanning leather. Acorns can be ground for flour, roasted for acorn coffee, or used as a food source for some livestock. Chestnut Oak (Quercus Acuminata) - A tall tree with a maximum height of over 150 feet, with grey flaky bark and chestnut-like leaves, shiny on the upper surface and greyish beneath. This should be a very useful Oak in certain soils in Britain supposed to be inimical to our own Oak. Eastern States and Canada, and westwards, in dry limestone soil. White Oak (Quercus Alba) - A fine forest tree, sometimes 150 feet high, with deeply-lobed but not sharp-pointed leaves, and grey bark scaling off in plates. A native of Canada and the more northern United States, its hardiness need not be doubted, and the wood is hard and tough and good. Turkey Oak (Quercus Cerris) - This is a valuable tree for garden and park. Though not unlike the common Oak in growth and branching, it is readily distinguished by its deeper green and finely cut foliage, and by its mossy-cupped acorns. It is also much more rapid in growth, and will flourish in light and varied soils. It retains its foliage longer than most other trees, and some of its varieties are almost evergreen. The chief of these is the Lucombe Oak, a tree of graceful growth, which rapidly ascends into a tall cone of foliage and retains its leaves through mild winters. The Fulham Oak is a similar tree of hybrid origin. It is also partially evergreen, and differs from the Lucombe Oak chiefly in its habit of growth being more spreading. The variety known as Q. austriaca sempervirens is a form of the Turkey Oak sub-evergreen in character and of medium growth, and useful for small gardens. These varieties rarely equal the wild tree in beauty or character, and have the disadvantage of being increased by grafting, which bars them from ever attaining the stature and dignity of the wild tree. Scarlet Oak The Scarlet Oak (Quercus Coccinea) - A forest tree, in its native country growing to 160 feet high, and one of the best N. American Oaks. It is a beautiful tree at all seasons, but particularly so in the autumn, when the rich scarlet and crimson hues of its foliage are very handsome. Hungarian Oak (Quercus Conferta) - This is a noble tree in its own country, and one of the quickest growing Oaks in cultivation. It has much larger leaves than the common Oak, and they are cut in much the same way. It is a good Oak to plant as a tree of the future, as it is very hardy and grows well in almost all kinds of soil. Bur Oak (Quercus Macrocarpa) - A large forest tree of a maximum height of 160 feet, with a trunk as much as 8 feet in diameter, and rather large, thin, deeply incised, but blunt-lobed, leaves, shiny on the upper side and whitish below. The timber is good and tough. A native of rich soils from Nova Scotia to Manitoba and also southwards. Post Oak Post Oak (Quercus Minor) - A tall tree, sometimes in its best state 100 feet high, with rough grey bark and deeply incised but blunt pointed leaves. The wood is very hard and durable. N. America. 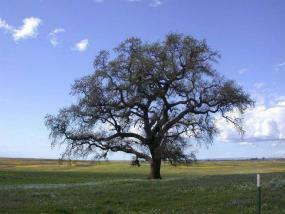 Water Oak (Quercus Nigra) - A forest tree, though not so tall as other Oaks-80 feet. There is a variety of it in cultivation named nobilis, which has leaves 9 inches or more in length of a rich green. It makes a handsome small tree. In wet and swampy ground, E. and W. United States, also southwards. Pin Oak (Quercus Palustris) - A forest tree with a maximum height of 120 feet. It is one of the quickest growing Oaks, and its chief beauty is the tender green, almost yellow, of the unfolding foliage in May and rich autumn tints. It soon makes a fine tree, and is one of the best to plant in marshy places, as it grows naturally in such ground. Leaves deeply cut, bright green and smooth. N. America. British Oak (Quercus Pedunculata) - Most valuable of British trees, and most beautiful in old age in many different states alike in wood, park, chase, by rivers, and in pasture land, and one which comes well into the home grounds in its old state, giving noble shade and fine beauty of form, as at Shrubland and in many other places. Botanists give this and the other British Oak under the general term of Q. Robur, but they are wrong, as the Oaks are distinct in form and habit. Of the varieties that differ from the type in growth the most distinct are fastigiata or pyramidalis, which is of much the same style of growth as the Lombardy Poplar, but does not grow so tall. The Weeping Oak (var. pendula) is as weeping as the Weeping Ash, and is a vigorous grower and a beautiful and graceful tree. There are several forms with cut leaves, the most distinct being those named filicifolia, or the Fern-leaved Oak, heteraphylla, and scolopendrifolia, which has leaves like a miniature Harts-tongue Fern. There are variegated forms of both the common type and of the Cypress Oak, but they are not so important for landscape effect as the varieties that take a natural color. As yet we have never seen any variety of Oak as handsome as the wild tree. It is frequently in forests over 100 feet high, giving a great quantity of valuable timber. The leaves fall earlier than those of the Durmast Oak, and are more varied in yellowish and brownish colors at the commencement of growth. Willow Oak (Quercus Phellos) - A forest tree 80 feet high, and unlike the other Oaks in its foliage, narrow and long like that of a Willow and whitish beneath, giving the tree a silvery appearance on a windy day. It is not a common tree, though it was introduced from N. America in the last century. It is of slow growth in cold places and soils, and thrives well and grows rapidly on well-drained light soils, especially in a gravelly subsoil. N. America. Swamp White Oak (Quercus Platinoides) - A large forest tree with flaky green bark, and in its best state reaching a height of over 100 feet, with slightly lobed leaves and the acorns on rather long stalks. It has good, tough, closely-grained wood, and is a native of moist and swampy soils in Canada and west to Michigan. Rock Chestnut Oak (Quercus Prinus) - Sometimes attains a height of 100 feet, the leaves somewhat chestnut-like, and bearing an edible acorn, in dry soil. Eastern States and Ontario and southwards. Champion Oak (Quercus Rubra) - A noble forest tree with a maximum height of nearly 150 feet, and one of the finest of American trees, remarkable for the richness of its autumn tints. It is a fine park tree, and also makes a beautiful shade tree for lawns. It grows best on a free and deep soil, and is much more rapid in growth on moist than on dry soils. Canada and Eastern States. Durmast Oak (Quercus Sessiliflora) - The second species of British Oak, and is often included with Q. pedunculata, but is distinct from a planters point of view, not being so long-lived or quite so noble a tree. It is none the less one of the finest forest trees of northern countries, and has a straighter and more cylindrical stem and form of tree even than the common Oak, is of a deeper green, denser foliage, and giving better covert and more leaf soil. The leaves a little longer than those of our other native Oak, sometimes, in mild winters, remain on the tree until the others come. Its area of distribution is slightly different, growing less in plains and valleys than our other Oak, but inhabiting plateaux and slopes of hills and mountains, rising to elevations of 3,000 to 4,000 feet, and also different from the common Oak in its thriving on gravelly, sandy, and calcareous soil. The qualities of the wood of the two kinds have been the subject of much discussion, perhaps often confused by the influence of soils. The wood of Q. sessiliflora is generally thought to be less tough and less resisting than that of the common Oak. It has a straighter fibre and finer grain. It has several varieties of little value. Black Oak Black Oak (Quercus Velutina) - A tall tree up to 150 feet, the outer bark a very dark brown with deeply cut leaves with sharp points. It is rare with us and worth a trial from seed sown where we wish it to grow, or from young seedling plants. Northern United States, Canada, and westwards, and also in the southern states. Quercus Acuta - Native of Japan, with dark leathery leaves about the size of those of the common-Cherry Laurel. It has not been long enough in the country to enable one to judge its merits as an adult tree, but even as a bush it is a fine object. Q. Buergeri robusta is a vigorous large-leaved form. Quercus Agrifolia - The Enceno of the Californian coast is a distinct Oak rarely seen in gardens, in aspect not unlike some forms of Q. Ilex, but the leaves are of a different shade of green. Dr Engelmann says it is "a large tree, with a stout, low trunk, often 8 to 12 feet, sometimes 16 to 21 feet, in circumference, and with a spread of branches of 120 feet." Californian Live Oak (Quercus Chrysolepis) - Along the coast ranges and along the western slopes of the Sierra Nevada, it forms a tree 3 to 5 feet in diameter of stem, or, at higher elevations, is reduced to a shrub. It has pretty spiny-toothed dark green leaves, somewhat golden on the under surface, and in its native country it is a beautiful evergreen tree. Quercus Coccifera - A dense bush with small spiny dark green leaves and very small acorns, often hardly larger than a pea, which now and then ripen in S. England. S. Europe. A tree 50 to 60 feet high, in some positions often a shrub. At Kew it grows freely in rather sheltered places, and produces fine leathery leaves of a dark green color, in outline somewhat like those of a small Spanish Chestnut. Mountains of California. Quercus Glabra - A Japanese Oak, with large handsome leaves, the acorns borne in upright spikes. Several varieties are mentioned in catalogues, but they are hardly distinct. At Kew the species makes a large bush, and is thoroughly hardy. Quercus Ilex - The best-known of Evergreen Oaks, and the most valuable for Britain. Old trees, which have been allowed plenty of space and have been allowed to grow naturally, resemble in form the Olive trees of the Italian coast and of the Riviera. It is one of the most variable of Oaks, but few of the named varieties-and there are many-are so beautiful as the wild kind. Cork Oak (Quercus Suber) - The Cork Oak, except for the curious growth of its bark, hardly differs in effect from the Holm Oak. There are fine old trees of this at Mount Edgcumbe, Goodwood, and other places, though the Cork Oak is not hardy enough for our climate generally. Live Oak (Quercus Virens) - In its native country a tree of the first economic value, it deserves all the encomiums passed on it by Cobbett in his Woodlands. All the trees in England I have seen under this name are, however, forms of Q. Ilex, and I doubt there being any fine trees of the true Q. virens in cultivation in this country. The majestic beauty of an oak is truly something to marvel at. If you don't have one in your landscape already, check with your local garden store to find a variety that suits the climate in your region.